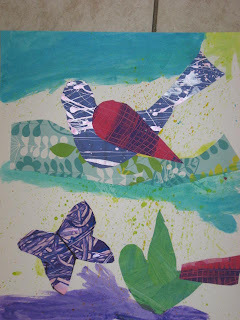 Each session I like to do a collage inspired by Eric Carle. Day 1 we work in stations, making unique textures and patterns on paper. We use combs, chopsticks, q-tips, cotton balls, splatter painting and more. Each child will have 4 different colored and patterened papers. 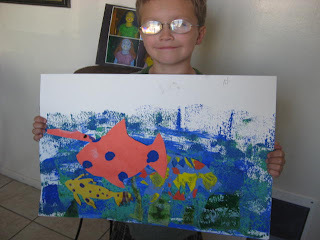 For the fish collage we used sponges double dipped in blue and green to create our ocean. Day 2 we cut out our fish and add some tissue paper sea weed.